Rivaling the Sydney Opera House for architectural beauty the Taj Mahal definitely doesn’t disappoint it’s thousands of visitors. 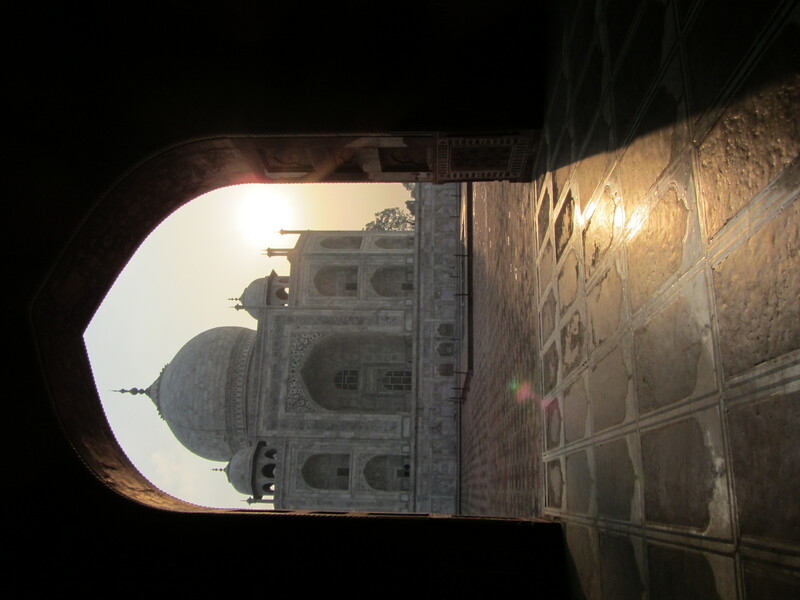 Starting at first light, then all throughout the day, they’re herded through check points, with a search for weapons, food, chewing gum and anything else that might be considered harmful to this amazing white marble memorial to Shah Jahan’s wife Mumtaz. Even shoe covers are issued to the daily masses as a way to preserve the precious marble from further degradation. 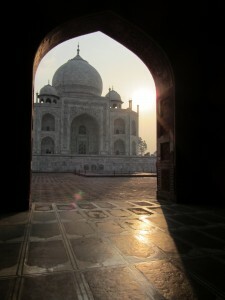 People posing, cameras clicking, guides chattering, touts touting, It’s a sea of global travelers, though most have not come to see India – they’re here for one night only, to snap the Taj Mahal then be on their way to the next wonder of the world. On Fridays the monument is closed for cleaning & the government is trying to reduce pollution further by converting all the transport vehicles to natural gas. There is no industry allowed to operate within a specific radius of the city but still a hazy smog hangs over the city much as it does elsewhere in India. Efforts are being made for change but there’s a long way to go before the country could ever be considered clean and green. In areas that used to be lush with grass and trees, salty ground water, pollution and forest removal have led to what is now a virtual dust bowl. The Red Fort, although impressive simply because of its size, did not show the splendour of the Taj but was still worthy of a visit. Hawkers everywhere were selling the usual array of junky souvenirs. “You buy, very cheap 500 rupees, my family make, very precious. Okay, for you today my first customer only 100 rupees.” You have to admire their persistence, but it’s heads down and no eye contact if I want to stay sane. The FN is carrying enough crap and even so much as a hand beaten nose ring is likely to see the bike collapse under the weight. More importantly is that I managed to buy a couple of spare tubes, though they’re not quite the right size and the quality is questionable but they may make all the difference in an emergency. Yesterday morning the tyre was flat but after pumping up again it’s remained firm so I figure the tube might have burst last week because I let the pressure get too low. There’s so much to think about each day and maintenance has to be my number one priority if I’m to make it to Belgium. Well, that and dodging goats on the freeway, overloaded camels, tuk tuks that have taken paint off my bike and all manner of things that don’t belong in traffic. The last time I saw a street sweeper on the freeway was in Mexico – it’s still a risky career move, but at least here they wear reflective jackets…that’s progress! Hi Ron,we been busy with the tyres, check your mail please,I think a solution is in the make. Some people will find out tomorrow if we have luck to find something. I received a message from Thomas and thank you to you, Geert and Thomas for all your help in trying to locate tyres. I understand it might be challenging to import them into India but I’ll face that problem if it happens. Meanwhile I look forward to hearing if you are successful. sorry——the tyres are in u.k. and from australia we dial 001144 1590 612261———–carry on. Just discovered your blog and find it inspirational. I am looking forward to reading and seeing more of your journey. Travel safe and have fun! LOL, good to hear you’re inspired – hope you’ve a journey planned yourself. Things are going good apart from tyre problems so need to get that sorted. Ron, I sincerely meant the “inspired” part. You’ve now got me thinking seriously about rides I’d like to do in a few years, when the work schedule eases up a bit. What you’ve done is taken away the “I’m too old to do something like that” excuse, for which I thank you. Hope the tire problems are easily fixed, and looking forward to see pictures of that lovely FN posing in places the manufacturer probably never thought it would go. I’m really impressed by what you are doing! I’m a 61-year-old motojournalist in Calif. I enjoy your blogs. I’m a friend of Ted Simon and Greg Frasier. You are the real deal, good on ya! Lovely photos…really enjoying them from the relative safety of the Hawkesbury River! Keep safe. Good to know you’re there on the Hawkesbury enjoying the experience. Nothing unsafe about India, but it’s a challenge in many other respects. Keep smiling and I will too. I build motorcycles in Delhi, just hoping that you are still here so i can see you for a chai/coffee/lunch (the whole menu). My Home is your Home Ron. I’ve broken a couple of spokes but have some spares. My main concern is the bike tyres which are not holding up well. if you know of anyone with some 26 x 2.5 good quality beaded edge tyres & tubes do let me know. I know it’s a long shot but worth putting the word out there. I might have to try for them in the UK. Following progress with interest. Lolly and Rudi say hello. Best wishes for a continued safe journey. Great to hear you’re coming along for the ride! Thanks for the good wishes. If I can survive this insane traffic I can survive anywhere! Really pleased to see you in some photos. Was thinking – to help avoid a sore backside, would the pants the dragon boat paddlers use help? They have gel inserts in the relevant place to help with the problems you’d expect from sitting/sliding on a hard wooden seat. Bit hard to take pictures of myself Sis. The gel pants would be good, I did consider them before I left, but it’s just another thing to pack. Lynne might bring me over a pair when she meets me in Turkey. I’ve stretched the leather on the seat so it should be good for now. On the road again tomorrow with everything now in shape. Well Ron, even with missing a bit of paint and maybe a tube sounds as if the trip is going OK so far. I hope you and Lynne enjoy your brief break together. Yes, we’re having a good time. It’s fun to share the day’s madness together. I’ll soon be on my own again and will miss the company. Funny that when there’s a billion people here! Hi Ron, and beware of their holly cows, I think they even are not wondered that you drive there a 100 year old motorcycle. I read that the road there a more the a mess and it is easier to drive in New York in a rush then on those Indians roads. Fingers crossed you went the good direction to Belgium and Getmany. We follows your “oldblokeonabike blog daily”!and always be happy to read something news from you and the FN. Fn oldtimers Jacques from his iPad. LOL Yes, the traffic is a mess, but somehow it all seems to work. FN going good. Spent yesterday doing repairs. Indian welding & spare parts questionable but everyone tries to be helpful. Two days rest and I’m itching to get on the road again. Only another week and I’ll be heading to Pakistan. Good to know you’re there with me Jacques. Hi, great blog and your efforts shame me to my core. Keep it up and good luck. One question – any way to see your old entries in this blog? Maybe its just me but I can’t work out how to do it…. You can see older posts by clicking on “older entries” on right hand side of page, then scroll down and click older entries again and get even older ones.